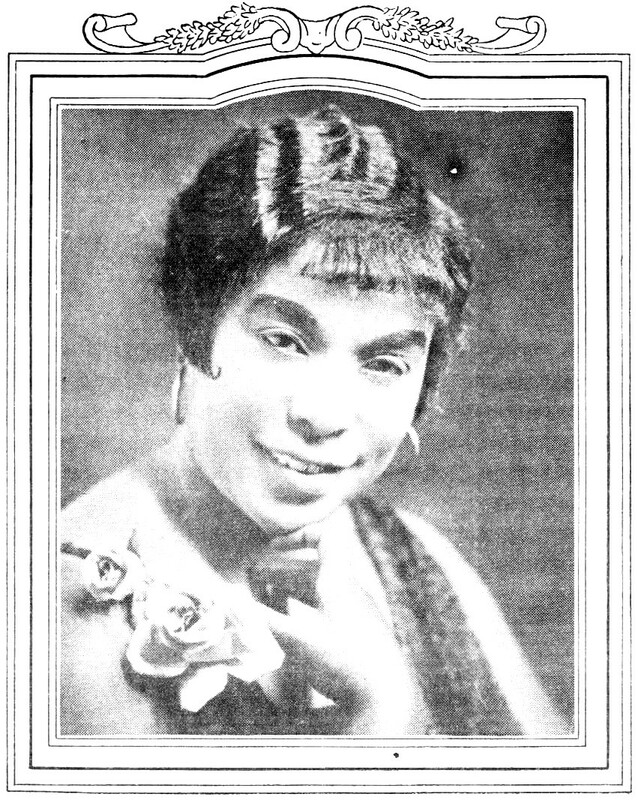 Elzadie Robinson, pictured in the Paramount Book of Blues, circa 1927. When asked to imagine “country blues,” what image springs to mind? Probably that of a lone man with an acoustic guitar busking on some southern street corner, or hiking down a lonesome dusty road. But ubiquitous as that description may seem, a woman and a piano can make for just as much of “country” blues as a man and a guitar, as proven by Elzadie Robinson on the pair of haunting, down home blues songs herein. Elzadie Robinson is believed to have been born on the twenty-fourth of April in either 1897 or 1900, and in Logansport, Louisiana, right on the border with Texas. Little is known of her early life, or what brought her into the world of the blues. Paramount promotional material reported that she began singing professionally around the age of twelve, and was popular in Houston and Galveston area cabarets. She and her accompanist Will Ezell were discovered in 1926 by Art Laibly of Paramount Records and referred to Chicago record. From then until 1929, she sang for the label, making a total of sixteen records. Singing mostly songs of her own composition, Robinson was most often accompanied by pianists such as Will Ezell or Bob Call, sometimes joined by more musicians such as Blind Blake or Johnny Dodds. She was distinguished alongside Ma Rainey and Ida Cox as one of Paramount’s most prominent blues ladies, and as such was honored with a segment dedicated to her in their circa 1927 publication The Paramount Book of Blues. She married Perry Henderson of Flint, Michigan, in 1928, and retired from music the following year. As with her upbringing, details surrounding her later life are obscure. Many years later, Ezadie Henderson died on January 17, 1975. William Ezell, Robinson’s most frequent accompanist, hailed from the eastern half of Texas; he was born in the town of Brenham on December 23, 1892. He got his start as an itinerant pianist in turpentine camp barrelhouses and the like deep in the Piney Woods of east Texas, the birthplace of the musical style known as boogie woogie. Traveling with Elzadie Robinson to Chicago in 1926, Ezell began recording extensively for Paramount Records in the five years that followed, both as an accompanist to singers like Robinson, Lucille Bogan, and others, and as a solo pianist and occasional vocalist, making several recordings with Blind Roosevelt Graves. 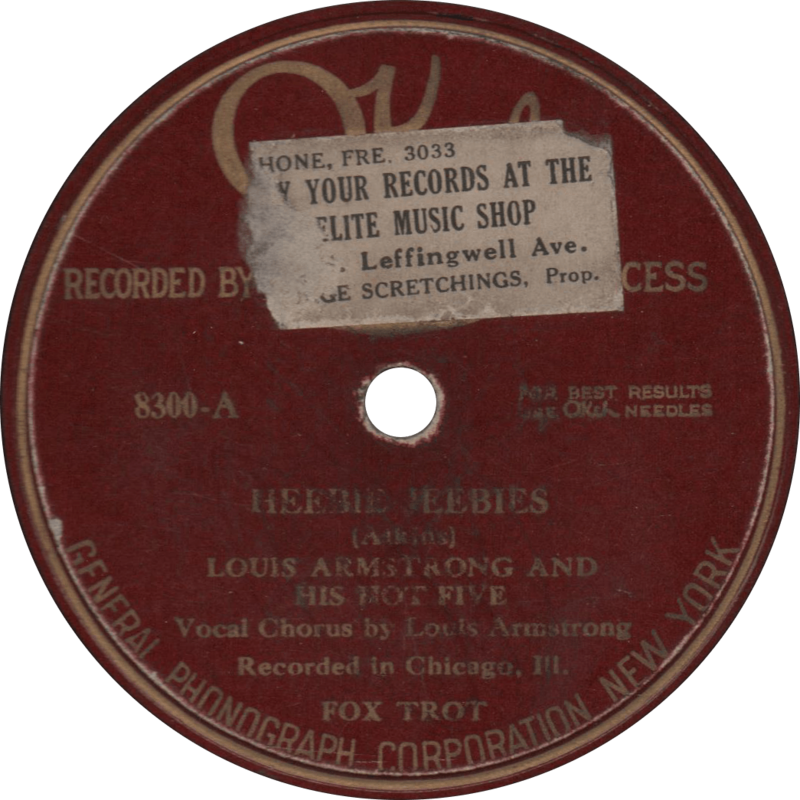 Recordings such as “Pitchin’ Boogie” and “Heifer Dust” helped to define the boogie woogie genre in its early years on records. It has been reported that following the death of Blind Lemon Jefferson in the winter of 1929, Ezell accompanied the musician’s body as it was transported by train back from Chicago to Wortham, Texas. He made his final recordings in 1931, as Paramount was faltering under the burden of the Great Depression, accompanying vaudevillian vocalist Slim Tarpley. He is said to have returned south to Louisiana after the demise of Paramount Records, but soon came back to Chicago, and continued playing professionally until at least the 1940s, at which time he was reportedly employed by the WPA as a watchman. Will Ezell died in Chiago on August 2, 1963. 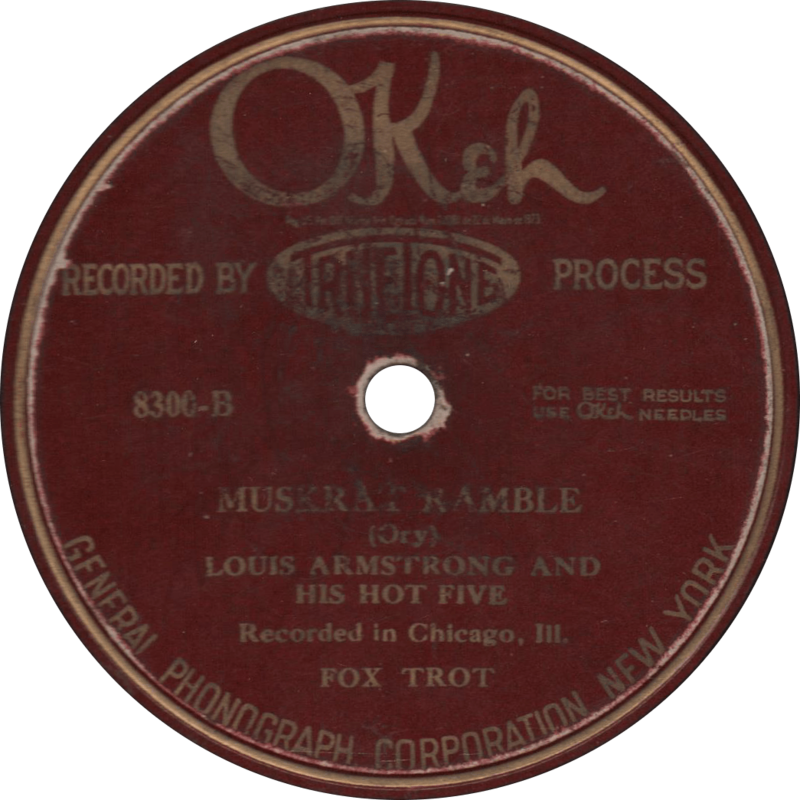 Paramount 12417 was recorded around October of 1926 in Chicago, Illinois. Of the two takes issued for both sides, these are “1” and “2”, respectively. 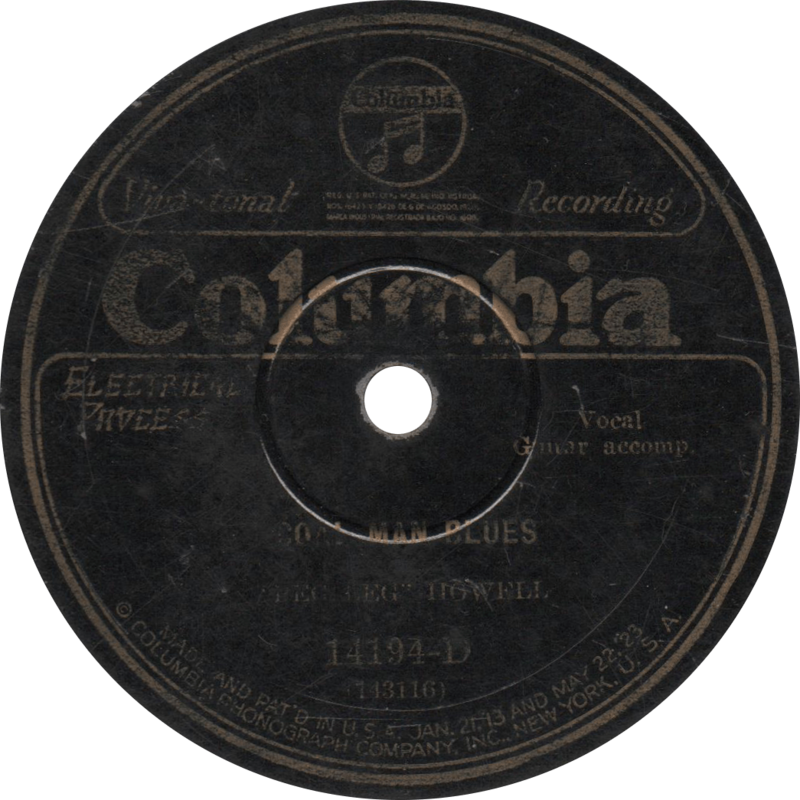 It is the first record of both Robinson and Ezell. First, Robinson and Ezell make a blues straight out of the East Texas lumber camps: “Sawmill Blues”. Robinson’s lazy vocals, seeming to hang behind Ezell’s piano playing, lend a candid, even dreamlike quality to the recording, as if we just stepped into a Piney Woods juke joint at the end of the night following a hard working day. 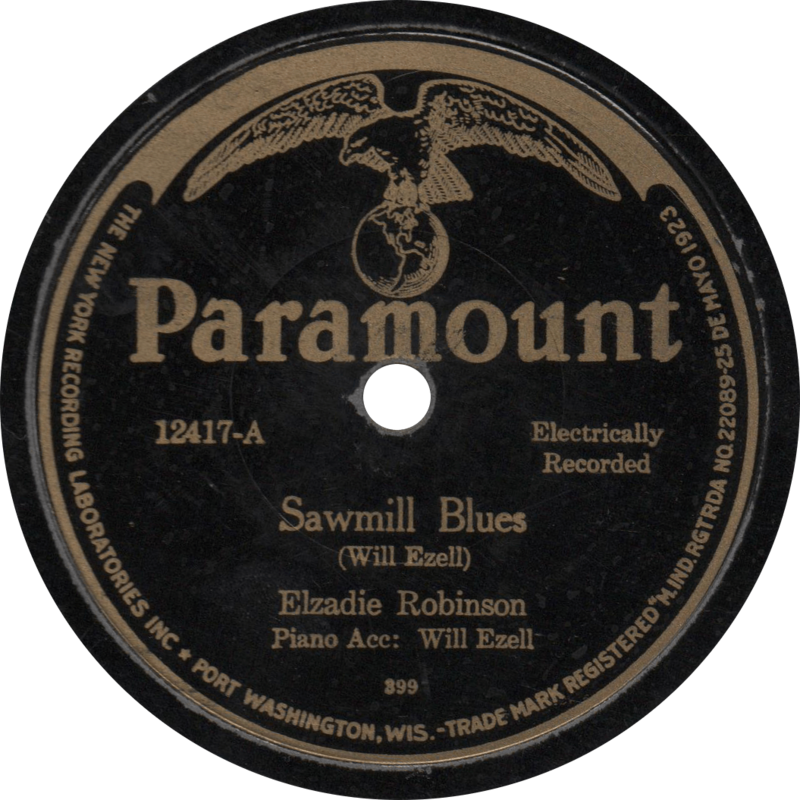 Sawmill Blues, recorded c. October 1926 by Elzadie Robinson. 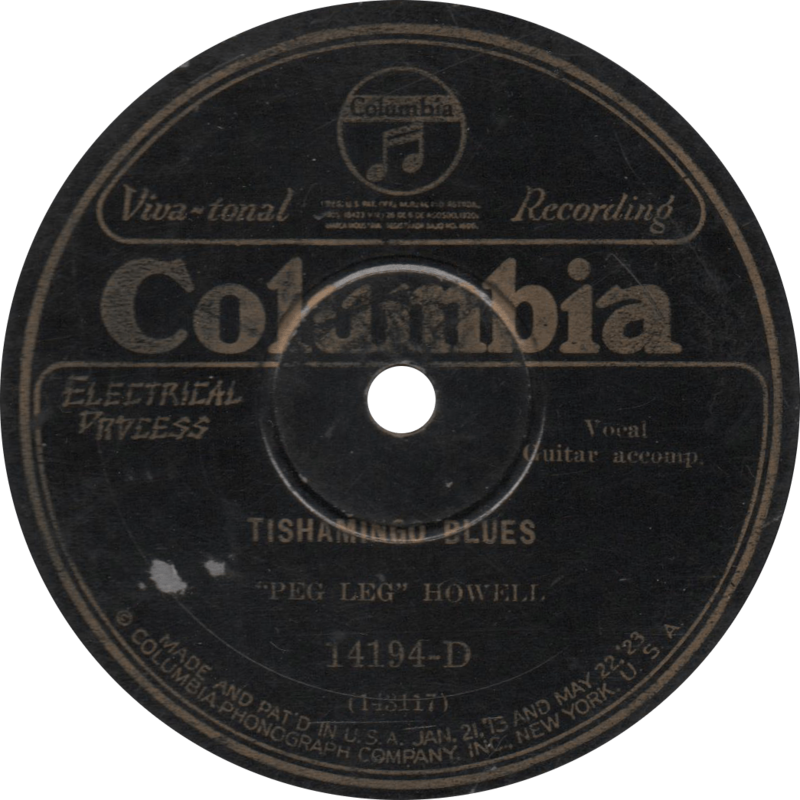 On the reverse, Elzadie’s vocal drifts in and out on the classic “Barrel House Man”—the melody of which was later appropriated for Lucille Bogan’s “Sloppy Drunk Blues” (this one’s better though, I say)—to Ezell’s strong accompaniment, making ample use of the sustain pedal for that genuine barrelhouse sound. 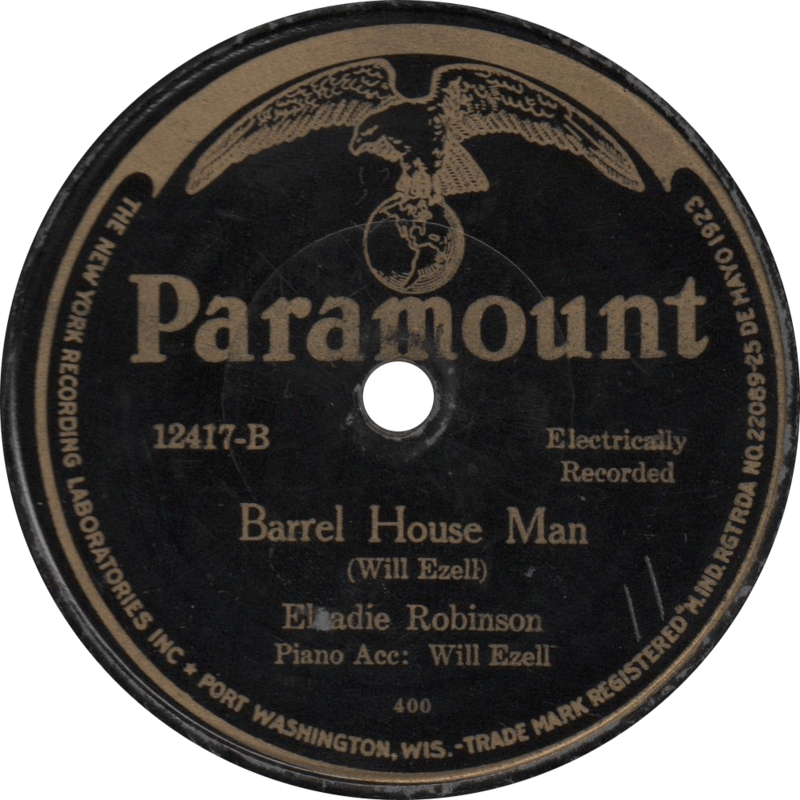 Barrel House Man, recorded c. October 1926 by Elzadie Robinson. Long before the days of so-called “country and western” music, real working cattlemen sang and played their songs out on the range. Regrettably, being so far away from centers of civilization, only relatively little of that authentic cowboy music was fortunate enough to be recorded for posterity before commercial hillbilly music took off. However, a handful of real cowboy singers and musicians did make it into the studio, including the Oklahoma Cowboy Band, founded by former Rough Rider Billy McGinty, which, unlike many contemporaries, would later go on to achieve nationwide acclaim. The Oklahoma Cowboy Band, directed by Otto Gray, broadcasting from the General Electric station WGY, Schenectady, N.Y. around 1930. Left-to-right: Otto Gray, Rex, Florence “Mommie” Gray, Owen “Zeb” Gray, “Chief” Sanders, Lee “Zeke” Allen, and Wade “Hy” Allen. 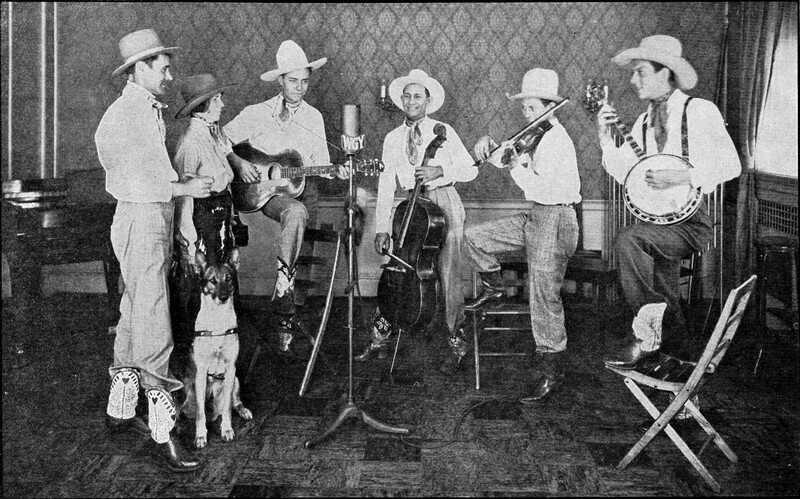 Pictured in Songs: Otto Gray and his Oklahoma Cowboys, 1930. Band founder and financier William M. “Billy” McGinty of the Indian Territory was a true cowboy of legendary stature. Born in Missouri on New Year’s Day of 1871, he started out punching cattle at the age of fourteen, on a ranch in Kansas. During those years, he got to know old west legends by the likes of outlaw Bill Doolin and built up a reputation for being able bust any bronc, no matter how tough it were. Following the loss of the Battleship Maine, he went south to join up with Teddy Roosevelt’s Rough Riders, going on to become a hero at the Battle of San Juan Hill—Roosevelt said of him, “we had no better or braver man in the fights”. When the war was through, he came back home to become a star of Buffalo Bill’s Wild West Show. Sometime in the early 1920s, McGinty founded the Oklahoma Cowboy Band of local musicians around Ripley, Oklahoma. The band made their first radio appearance in 1925 on Bristow, Oklahoma’s KFRU, and their first record for Okeh the following year. McGinty later retired as the band’s manager to focus on his ranch in Ingalls and his duties as postmaster of Ripley, leaving Otto Gray, who raised midget cattle in Stillwater and had previously served as the band’s director, to assume his position and lead the band to great national success. McGinty published an autobiography titled The Old West, as Written in the Words of Billy McGinty in 1937. In his later years, he served stints as president of the Roosevelt Rough Riders Association and the Cherokee Strip Cowpunchers Association. Billy McGinty died on May 21, 1961 at the age of ninety, and was buried in the Ingalls Cemetery. Okeh 45057 was recorded in St. Louis, Missouri in May of 1926 by Dave Cutrell and McGinty’s Oklahoma Cowboy Band (Otto Gray, director). 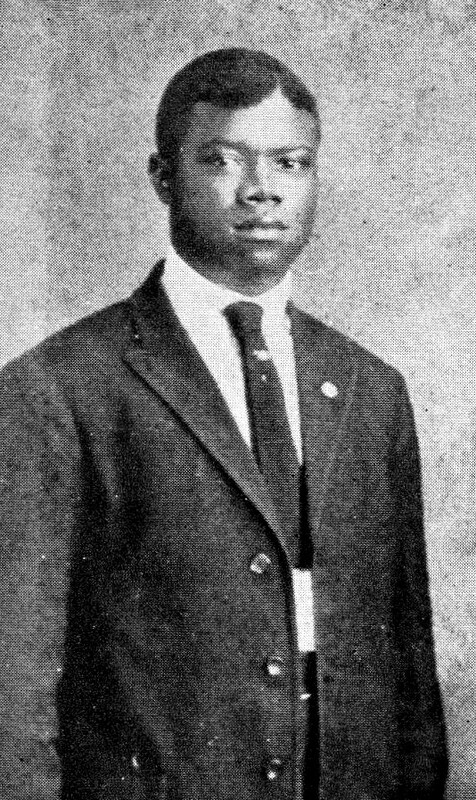 Both the DAHR and Rust and Laird’s Discography of OKeh Records, 1918-1934 place the recordings in Atlanta, Georgia in March of that year, but earlier pressings on the state “Recorded in St. Louis” on the label, and Victoria Spivey made her first recordings on the adjoining matrices in St. Louis on May 11, 1926, likely placing these around that date. The May date is further corroborated by Tony Russell’s Country Music Records: A Discography, 1921-1942. Although the label credits McGinty’s band as accompanying Cutrell’s vocal on the first side, he is backed only by a single guitar, likely his own. The personnel of McGinty’s Cowboy Band for this session is unknown, but it may include Cutrell. McGinty’s band cut two additional unissued sides that day, the titles and contents of which are lost to time. Dave Cutrell’s recording of “Pistol Pete’s Midnight Special” holds the distinction of being the first recorded version of the traditional prison song “The Midnight Special”. It was subsequently recorded by Wilmer Watts and his Lonely Eagles for Paramount around April of 1927 as “Walk Right in Belmont”, blues man Sam Collins for Gennett that September, and again by Otto Gray’s Oklahoma Cowboy Band in March of 1929. In the next decade, the song came to be associated with Lead Belly, who made his first of at least five recordings of the song at his second Library of Congress session with John Avery Lomax while still incarcerated at Angola Prison Farm on July 1, 1934. Since then, it has been recorded countless times in a variety of styles and genres. 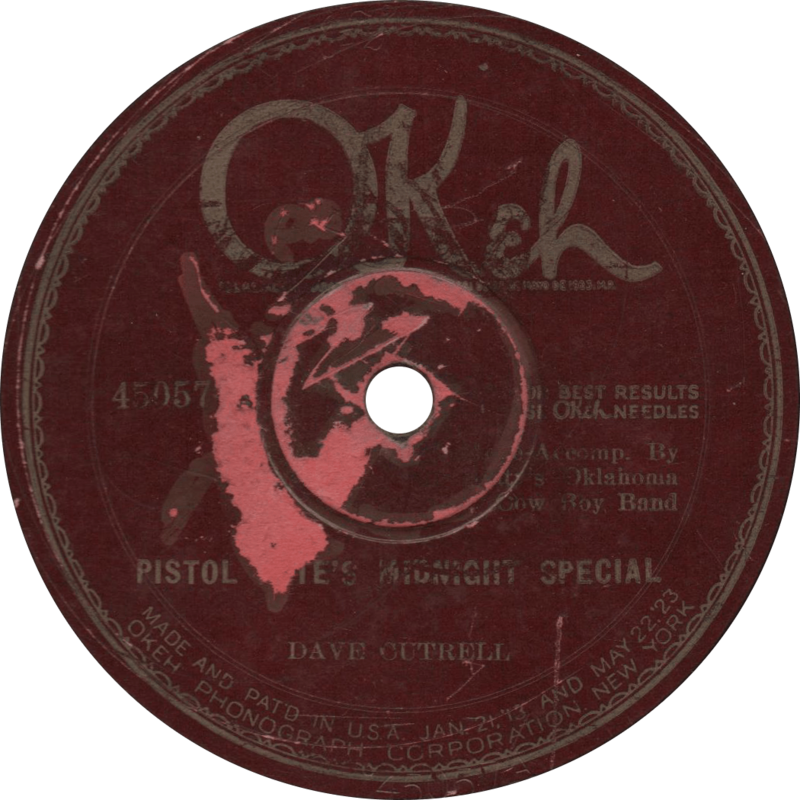 Pistol Pete’s Midnight Special, recorded c. May 1926 by Dave Cutrell. On the “B” side, with fiddle, guitar, banjo, and ‘cello, McGinty’s Oklahoma Cowboy Band plays a rousing instrumental of “Cow Boy’s Dream” that puts you right there by the campfire. In my opinion, this side is one of only a few records that capture the mystique of the wide open space of the Old West. It also appears that whoever was typesetting the labels for Okeh that day wasn’t too fond of compound words. 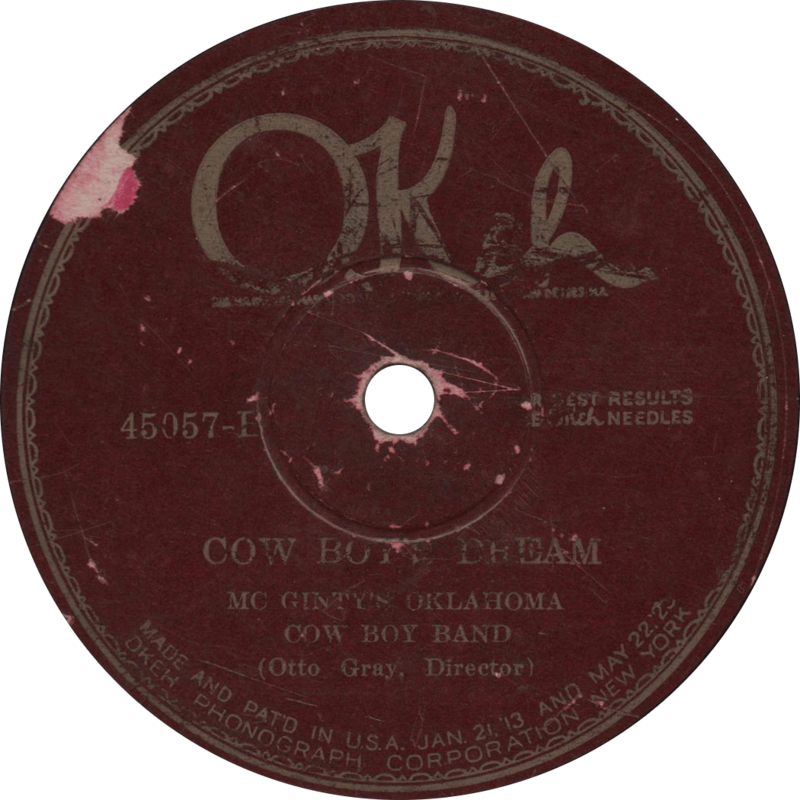 Cow Boy’s Dream, recorded c. May 1926 by Mc Ginty’s Oklahoma Cow Boy Band (Otto Gray, Director). 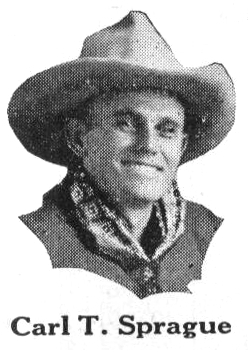 Texas boy Carl T. Sprague was among the first cowboy singers to make records, with his first session taking place in 1925. He also holds the uncommon distinction of being perhaps my favorite cowboy singer. Sprague as pictured in Victor’s 1930 catalog of Old Familiar Tunes. Carl Tyler Sprague was born in Brazoria County, Texas, near the town of Manvel, on May 10, 1895. His family was involved in the thriving cattle business, through which the young Sprague learned the traditional songs of the cowboy. He attended Texas A&M to study agriculture, but was interrupted by the First World War, in which he served as a member of the U.S. Army Signal Corps. After the war’s end, he returned to Texas A&M, and graduated with a degree in animal husbandry. After graduating, he was employed as an athletic instructor at the university, a position which he held from 1922 until 1937, and acquired the nickname “Doc”. Following the success of Vernon Dalhart’s “mountaineer’s songs”, Sprague wrote to the Victor Talking Machine Company expressing interest having them record some of his cowboy songs. They apparently obliged, and Sprague traveled to Camden, New Jersey to make two test recordings. Victor must’ve liked them, because two months later, he returned to record a series of ten sides in sessions on the third, fourth, and fifth of August, 1925, half of which were issued. His first record, “When the Work’s All Done This Fall”, became quite a hit, and proved that people were interested in hearing the song of the cowboy. That was followed by a further three sessions over the following three years in Camden, Savannah, Georgia, and Dallas, producing eighteen more sides, all of which were released. In spite of his records’ success, singing was but a hobby for Sprague, and he did not pursue a music career outside of record-making. He left his post at Texas A&M in 1937 and opened a store in Bryan, and when the Second World War rolled in, he served once again, as a recruiter. The folk revival of the 1960s brought Sprague back into music, and he played and lectured around the country, and recorded two LPs in 1972 and ’74. Carl T. Sprague died on February 21, 1979 in Bryan, Texas, where he had called home since 1920. Victor 20122 was recorded in Camden, New Jersey on June 22, 1926, at Sprague’s second series of sessions. The record was released in December of the same year, and remained in the catalog all the way until 1944, perhaps indicating it was Sprague’s greatest success. Sprague is accompanied by two fiddles played by H.J. McKenzie and C.R. Dockum. Stark, bleak, and sorrowful, “O Bury Me Not On the Lone Prairie (The Dying Cowboy)” is a mesmerizing, repetitive, and minimalistic piece, with Sprague’s vocal backed by the beat of his guitar and the forlorn fiddle’s croon, which I feel really encapsulates an archetype of cowboy music. The song has been featured in recent years on Dust-to-Digital’s evocative multimedia collection I Listen to the Wind That Obliterates My Traces: Music in Vernacular Photographs (1880-1955). 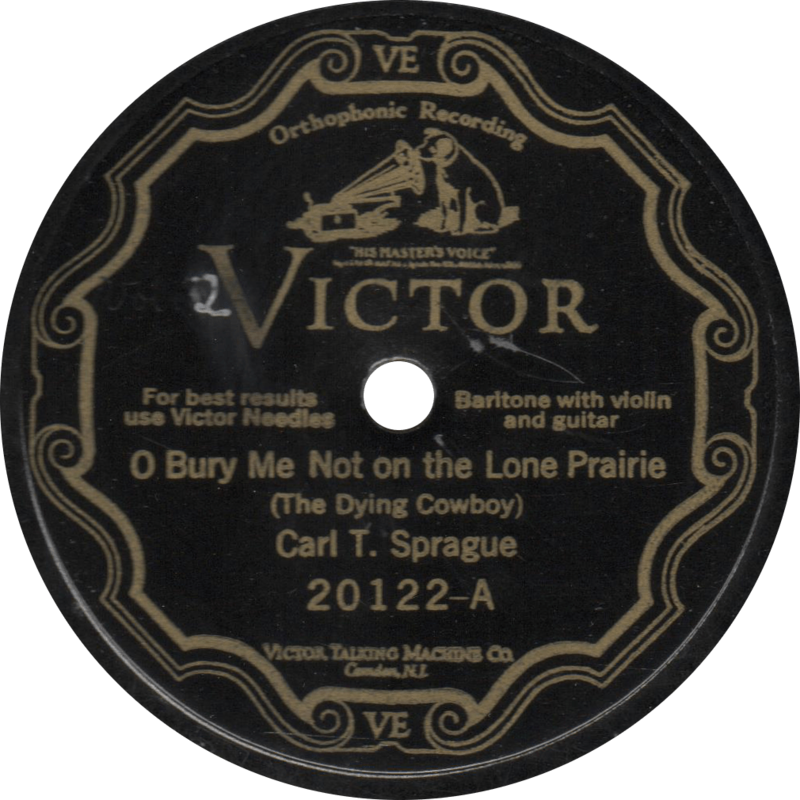 O Bury Me Not On the Lone Prairie (The Dying Cowboy), recorded June 22, 1926 by Carl T. Sprague. On “B”, Sprague sings “The Cowboy’s Dream”, a less depressing and rather enchanting melody. It also provides a demonstration of Sprague’s distinctive and simple-yet-pleasing style of playing guitar, which from both aural and photographic evidence, seems to have been done on a metal-bodied resonator, or at least it was by the end of his recording career in 1929. 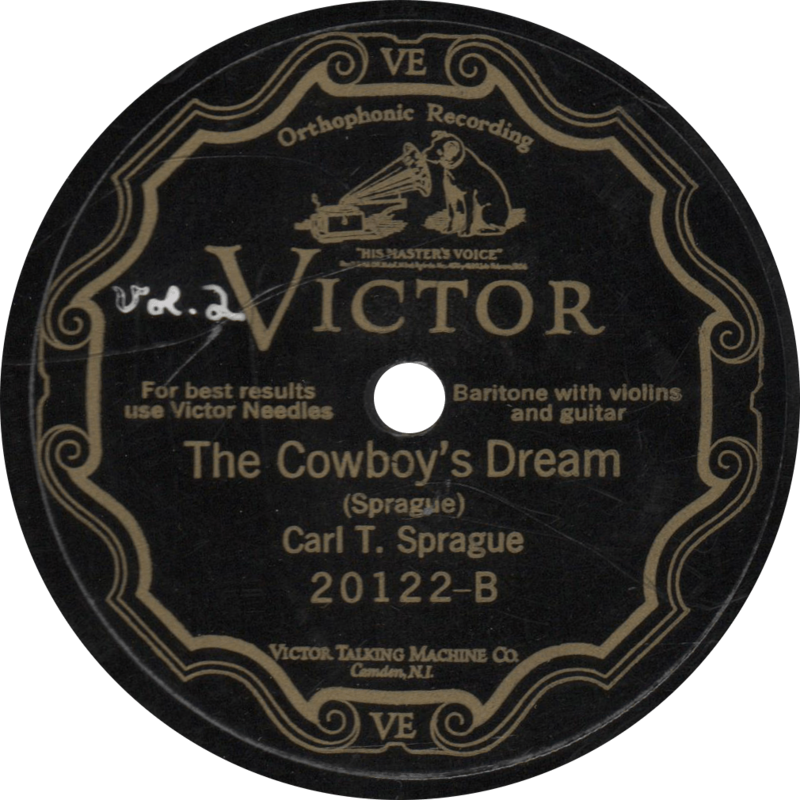 The Cowboy’s Dream, recorded June 26, 1926 by Carl T. Sprague.